EXPERIENCE SIESTA KEY BY WATER: Arrange a pontoon boat rental from “The Black Pearl” (exclusive to our guests only!) for a portion of the week. We’ll be happy to assist. If you have interest, just let one of our reservationists know during your booking, and they can give you more information. Welcome to Coconut Grove! A private home nestled right in the heart of the Siesta Village with the style, elegance and charm of Siesta Key. Enjoy a family home that sleeps 16, a private heated pool, and quite literally in the heart of Siesta Village! Coconut Grove features a unique combination of two units combined ("Pinacolada" and "Baybreeze") creating a perfect sense of space between being under one roof and yet plenty of separation for times of self-indulgence. Inspired by island living, this beautiful retreat embodies relaxation and peace of mind. Tucked behind the village, it gives just enough privacy to make you feel you are in your own haven of serenity, but step outside and be right in the midst of America's #1 Beach and the village surrounding it. And what more could you want other than beaches, beaches and more beaches!!! How about the fact that everything is in walking distance! From restaurants, bars, shopping, and entertainment, it encompasses all things that make a vacation great! There is always live music and fresh seafood waiting for you, your family and friends right around every corner! Being this close to the beach means a quick stroll over to the best part of Siesta- we even provide beach caddies, chairs, and towels to make it that much more achievable and relaxing. Meander on foot and feel the soft sugary sand under your feet in less than 3 minutes, or hop on the free trolleys provided and take a day excursion exploring the village and the cool sandy beaches from north to south. 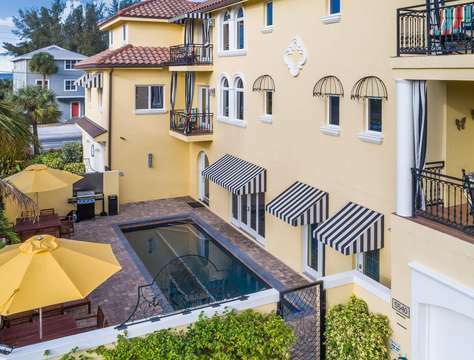 The home features a private heated pool, a gas grill, private pool area, a view of Siesta Key Village and many other great amenities to make your daily adventures more fun than ever. Inside, the home is outfitted with an open kitchen and living room floor plan on both sides, making it ideal to entertain many guests at once. Inside each unit, you will find the master features a king size bed and a private bathroom. The two guest rooms feature 1 queen in the first and two queens in the second. There is a shared guest bathroom for the guest rooms and a half bath nearest to the living area. The home comfortably sleeps 16 altogether (8 on each side). Coconut Grove is luxurious in every sense of the word. Plush bedding and pillows, HDTVs in all the bedrooms and the living room, balconies extending from the living room and kitchen areas and a staircase from the top unit leading down to the tranquil pool area. Grab a beverage or two, and head down to the poolside to grill out for a private evening under the stars. Kick back and listen to the sounds of Siesta as night descends. Being in the heart of it all makes Siesta Key that much more amazing in every way. Embrace love, laughter, and happiness on your vacation right here, inspired by the beauty of Siesta Key! Luna Flores is a uniquely configured villa featuring a combination of two special vacation homes. Luna Flores is specially designed to include two separated living areas called Villa Las Flores and Luna Nueva. Located just off island with easy access to Siesta Key (approximately less than 10 minutes away via car). This midtown vacation home is within walking distance of amazing array of restaurants and shops to include Trader Joe's market just a block away. This 6 bedroom combination is fully furnished, each with wall-mounted HDTVs, ceiling fans. There are two bathrooms featuring slate floors, with an expansive shower in one and a tub/shower configuration in the other, and beautiful cabinetry.The dining rooms seat 6 plus additional 4 if seated at the bar counter. Both kitchens feature stainless steel equipment to include a refrigerator, microwave, stove/oven and a dishwasher. Every detail is driven by your gourmet chef's needs to include granite counters and a gooseneck sink faucet. Each home also has a laundry room off the kitchen area. Outside, an exterior privacy fence surrounds each home and has been entirely revised and replaced, along with an additional expansive paver area, lush landscaping and night lighting. Did we mention each home has a private heated pool! Welcome to your new vacation home combination of Luna Flores! Contact our vacation specialist for reserve your space at either Villa or both! Welcome to the Sandy Seahorse Cottage! These units [Sandy Cabana & Seahorse Cabana] can be rented separately. This uniquely configured private home [Sandy Cabana and Seahorse Cabana] is the perfect escape for you and your family and friends. This gorgeous beachy getaway comfortably sleeps 12 with a little room for more! The property has recently been updated with new furnishings. The 6BR/ 5BA spacious floor plan includes 2 king beds, 2 queen beds, 4 twin beds, 2 queen air beds and can accommodate up to 16 guests (12 Adults Maximum). Additionally, there are fully equipped kitchens, washer/dryers in each unit, and screened in lanais. If you need to stay connected there are 6 flat screen TVs, cable television, free WiFi and a telephone. The location is exceptional- just a short 1.5 block walk to Point of the Rocks beach access and the beautiful white sands of Crescent Beach. No need to drive anywhere with less than a ¼ mile walk to great shops, bars, restaurants, grocery store and drug store all located in the South Village-Crescent Beach area. Welcome to Sophie’s Quartier, a waterfront compound consisting of two homes one and a half blocks from world famous Siesta Key Beach! This is a perfect retreat for huge family and friends’ get togethers! 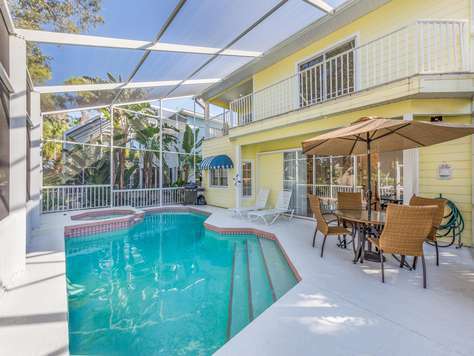 Enjoy two heated pools, one hot tub, and two docks overlooking The Grand Canal of Siesta Key. Minutes walk from fun and famous Siesta Key Village, you won't find a better location! These homes are side by side making this family compound the perfect spot for holidays and vacations for larger extended families and friends traveling together or If you can rent either home separately as well. Sophie's Cottage sleeps up to 8 with a King bed in the master [sleeps 2] one guest room with a queen bed [sleeps 2], an Ikea convertible queen sofa bed in the living room [sleeps 2], and finally an Ikea convertible queen futon bed in the 3rd room [sleeps 2], and has two (2) bathrooms. Villa Champagne with it's four (4) bedrooms and three and one/half bathrooms has a gorgeous gourmet kitchen complete with double oven. An expansive dining room that seats 10 with the wrap around bar offers plenty of dining space for everybody. Upstairs you’ll find a master bedroom with a King-size bed, an ensuite expansive full bathroom, private outside deck and lovely furnishings. The second bedroom features a queen bed, with an adjacent full bathroom. Bedroom three features two twin beds and cute beach style beautiful décor. Another full bathroom separates the fourth bedroom which features a queen size bed and very nice furnishings. This villa easily accommodates 8 adults (and room for the little ones!) sleeping in various bed configurations. Flat panel televisions abound everywhere but an outside balcony and a screened in pool will quickly compel you to slip outside into the Florida sunshine and warmth and explore the meandering path to the canal dock. Sophie’s Cottage sleeps up to 8 with a king bed in the master [sleeps 2], a queen bed in the 2nd master [sleeps 2], an Ikea convertible queen sofa bed in the living room [sleeps 2] and finally a convertible queen futon bed in the 3rd room [sleeps 2]. Flat panel televisions abound everywhere here as well, but a huge outside sun deck of soft gray pavers will quickly compel you to slip outside into the Florida sunshine and warmth. You also have the opportunity to explore the canal system with five kayaks available to you or explore the island with eight bikes available for your use as well. At night the waters light up at the enormous fishing docks on the canal where you and your family will be challenged with an abundance of large fish which include snook, red fish and snapper that love to gather around the snook light each evening. Everyone will truly be in-captivated by both the fish and light. Yes, you can fish off the docks too! You can tie your boat up to both docks or arrange a pontoon boat rental from “The Black Pearl” (exclusive to our guests only!) for a portion of the week. We’ll be happy to assist. If you have interest, just let one of our reservationist know during your booking, and they can give you more information. Welcome to The Solaster! Our newly renovated luxury cottage has all the amenities your large group [up to 20!!!] will enjoy. Inside you’ll enjoy contemporary porcelain wood style flooring throughout gorgeous and decadent bathrooms, new appliances, new washers/dryers, quartz counters and state of the art stainless steel appliances in the newly remodeled kitchen, and two of your very own private pools among many other great amenities. Walking to the pristine Crescent beach is effortless with 2 rolling beach caddies, 2 coolers, 8 beach chairs and beach towels for everyone. Enjoy exploring the key on eight (8) bicycles! Renting beach equipment is not necessary at The Solaster! Just bring your flipflops, suntan lotion and shades! The Solaster is the configuration of two Casitas (Casita Morning Star and Casita Sun Star) combined, each having 3 bedrooms and 3 bathrooms, each with their own heated pool and private screened in lanais just a moments walk to Point of Rocks Beach. Perfect for larger parties celebrating family reunions, weddings, special anniversaries, and more. In each home, there are three bedrooms, two of which featuring king size beds (sleeping 2 in each room) and one room that has two full beds (sleeps 4).Enjoy a plush and comfy Queen sofa sleeper in the living room (sleeps 2). Casita Morning Star and Casita Sun Star together sleeps 10 in each unit with maximum comfort because of their open and spacious floor plans. Two full size laundries inside each casita, assures you an abundance of clean clothes and towels. Restaurants in the immediate area include some of the best on Siesta Key: Miguel’s, Capt. Curt’s, Turtle’s on Little Sarasota Bay, Ophelia’s on the Bay, Clayton’s Siesta Grill, Crescent Club, City Pizza and Anna’s Deli just to mention a few. Davidson’s Drug, the US Post office and numerous souvenir shops, giftware shops, and eateries await your adventuresome spirit. Siesta Key Public beach is about 2 miles north on Midnight Pass Rd and provides parking capability for 800 cars along with restrooms and snack bar, etc.